Well, anyway, this is our opportunity to give kudos and recognition to the tireless warriors on the frontlines, constantly fighting for our musical freedom by offering reissues of long lost treasures or creating new and interesting musics based around classic exotica principles. As such we present: The Kahunas. These awards are awarded to acts and albums nominated by and voted on by Exotica List members themselves. The categories include the traditional musical categories like best act, best album and best soundtrack. They also include two "lifetime achievement awards". First is the Big Kahuna, which is given to an individual or group that has helped to propagate the music we all know and love. Second is the Golden Bamboo Platter, which is awarded to a classic exotica album from the past. We hope that these become a staple of the Exotica List, occurring every year to award the efforts and output from the previous year. 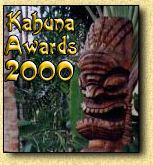 We also encourage any winners to use the Kahuna award logo to show that they have won (or been nominated) for such a prestigious award. Finally, thanks go to the list members for participating in the first place, and to Kevin Crossman for hosting the tally page and designing the award. This site was created by Kevin Crossman. You may send us email: exotica@kevdo.com.